There are some options if we want to find furniture for outdoors. You may have discovered by now that outdoor wood furniture is not nearly as popular as it once was if we are searching for outdoor garden furniture. Outdoor furniture alternatives have been cheaper than traditional wood for a while now. Metal and plastic, for example, can be machined and mass produced, eliminating any expertise required of an individual craftsman. These alternatives also require less upkeep than wood furniture to further entice homeowners. That said, though more expensive, handcrafted wood is, well, handcrafted. Your neighbors across the street will not be able to go out and just duplicate your beautiful outdoor garden furniture with a quick stop to Home Depot. Your outdoor furniture will be your own. Plus, while there are some reasonable facsimiles of wood furniture, nothing beats the real thing, and nobody can deny that wood furniture is second to none for beauty. 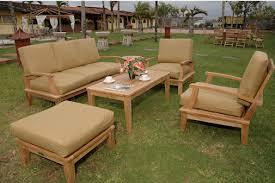 The most common type of outdoor wood furniture is teak furniture by far. Teak outdoor furniture is one of the most attractive, weather resistant, longest lasting types of outdoor furniture available on the market. On top of that, it is almost maintenance free and made from a renewable resource. making it not only a cost effective solution to your outdoor furniture needs, but also a purchase you can make with a clean conscience. You can have outdoor wood furniture made from almost any type of wood, but you should plan on having it treated, sealed, and re-sealed every year or two. If you don’t choose teak, at least check into the performance of your wood of choice for resistance to rot and pests. Even homeowners who have the financial resources rarely want to pay top dollar for outdoor furniture that will struggle to last even a year or two outdoors. Wooden furniture is usually best utilized as outdoor garden furniture. 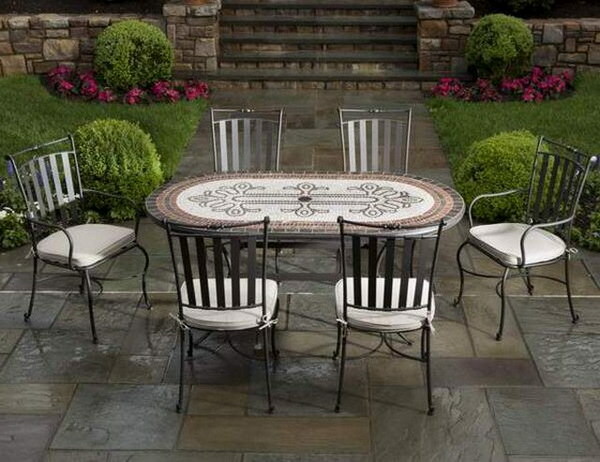 First, the look of your outdoor furniture is paramount to creating a beautiful garden. The harsh look of outdoor metal furniture just doesn’t cut it for some gardens. Secondly, outdoor garden furniture is often used less and, in general, takes less abuse than outdoor patio furniture. The one exception, however, is the possibility of attracting pests. Usually wood-consuming pests and garden-consuming pests are of two different varieties, but it’s still a good idea to check with a professional gardener. You’ll want to avoid planting flowers that may attract pests that will destroy your furniture. Still, outdoor wooden furniture can be used as outdoor patio or deck furniture. Few types of furniture will impress like outdoor wooden furniture if you’ve got the financial resources. Plus, you will have the satisfaction of knowing that the furniture will be used on a more regular basis. Again, teak is probably your best bet, but you r options may be expanded somewhat if you have a covered deck or patio. Nothing is going to eliminate the maintenance and care that outdoor furniture requires, but the better the protection you can give your furniture, the longer it will last and the more sense the investment will make. Teak has been long heralded as a wood known for its durability and longevity. In fact, in the eighteenth century, it was almost exclusively used on seagoing vessels as decks and railings, specifically because of its resistance to weather and water damage. It was the wood garnished from these vessels, once they were retired, that was used to construct the first teak outdoor furniture. With a history like that, it’s easy to see why this tropical wood is generally regarded as one of the premier materials for building outdoor furniture, be it loungers, deck chairs, tables, or benches. In fact, it has been known to last for a hundred years and running, truly making teak furniture the last outdoor furniture you’ll ever need to buy. The properties that make teak such as a well suited material for this use are two fold. First of all, it’s high in natural oils, making it naturally resistant to rain, snow, and other damaging weather. Second, it has an exceptionally tight resists splintering. Both of these qualities have served to make it a perfectly suited material for the construction of quality furniture for outdoor use. Depending on how you want your furniture to look, it’s perfectly acceptable to never touch your furniture except when you are kicking back in it on a beautiful, sunny day. Perhaps the greatest draw of this proven outdoor furniture is the maintenance required to keep it functional: none. As mentioned earlier, it won’t rot, splinter or deteriorate in any way. The only side effect of no maintenance is that it will eventually turn a light shade of silvery gray, a look many homeowners actually enjoy. The wicker can be made from any number of material including willow, bamboo, rattan, reed, or synthetic materials. Wicker furniture is made from thin, slender branches woven around a frame to create variously shaped items. Its soft feel is a rarity for outdoor furniture options. Wickerwork doesn’t require the same level of skill as, say, fashioning wrought iron, but does involve intricate craftsmanship. Basic wicker furniture isn’t that hard to create, but the best pieces out there can only he made by experienced wickerwork artisans. Outdoor wicker furniture has a lot of things going for it’s lightweight but sturdy, creating durable but easily moved outdoor furniture. It’s also considerably cheaper than either metal or wood furniture. Of course, you could always go with plastic, but plastic lacks aesthetic appeal. Outdoor wicker furniture has many of the same benefits of plastic, but looks a whole lot better on your patio. 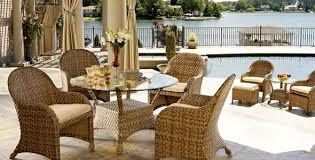 And to top it all off, wicker furniture is among the most comfortable outdoor furniture there is. Outdoor wicker patio furniture isn’t going to fall apart you after its first storm, but taking good care of your furniture will increase its lifetime exponentially. You’ll keep your outdoor wicker patio furniture looking like new by taking some or all of the following measures. For basic sheltering, buy furniture covers to keep your furniture from the elements as much as possible. When you are not using it, you could also store your wicker furniture, but this is an unnecessary inconvenience. Your covers should be easily removable but still keep your furniture relatively protected. More than just water, excessive heat can also damage your furniture. Too much heat will dry your furniture out, making it brittle and easily frayed. Place your patio furniture in the shade where you can keep it from the heat and provide a more comfortable sitting space for yourself as much as possible. You’ll need to re-coat it if your outdoor wicker patio furniture doe fray and crack the varnish. Without a sealed varnish, significant damage can come to your wicker furniture rendering it unserviceable. Plus, re-coating your patio furniture will help keep it looking like new. Wrought iron patio furniture is the most common wrought iron furniture. Beautiful, decorative, and sturdy, wrought iron will hold up to the elements and remain as elegant as ever. True wrought iron is becoming rare. The contemporary replacement is a form mild steel that looks and acts very similar to wrought iron. In fact, ornamental ironwork, whether mild steel or pure wrought iron, can be still be referred to as wrought iron. If this was the first time the chair had ever been created, an artisan still has to go trough the same process even when you buy a piece of wrought iron furniture from a manufacturer’s brochure. The process of creating wrought iron requires handcrafted precision. You can draw your own design for your wrought iron furniture if you like. The pint here is that having your wrought iron furniture designed just for you shouldn’t cause the price to suddenly skyrocket. Some companies will even trademark your furniture specifically for you, guaranteeing your furniture is one of a kind. The ability to machine iron or mild steel into a wrought iron appearance has made this type of material more economical recently. Wrought means “to work” in this case, the metal. In other words, the technology now exists to create a wrought iron look from machined steel, making the label a complete misnomer. Pure, handcrafted wrought iron may become a valuable antique item in the near future. The finish of wrought iron changes overtime similar to copper and bronze. This is called patination, although unlike bronze, a wrought iron patina doesn’t make it completely impervious to rust. Many homeowners like the look of a metal patina. You can leave the wrought iron to age gracefully on its own time and take the chance that you have to treat it later for rust. Or, you can have the wrought iron oxidized when it’s first forged to create a more durable and controlled look. If you like the look of new wrought iron or don’t want to worry about rust, then galvanizing the wrought iron, coating it with a thin layer of zinc will prevent the metal from rusting.